Popcorn has never tasted so good. Delighting the world with popcorn for over 35 years, our innovative flavors provide unforgettable snacking experiences. We infuse our popcorn with great taste and flavor, including real butter, cheddar, caramel, and chocolate. 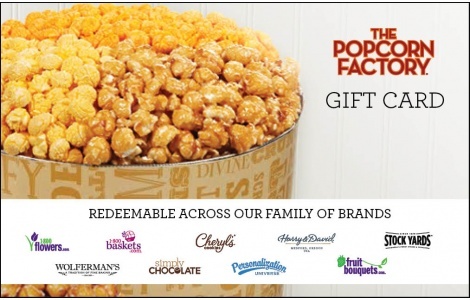 The Popcorn Factory gifts in a variety of exclusively designed tings are perfect for birthdays, congratulations, holidays and so much more. Share the fun! This gift card can also be redeemed at any of 1800Flowers.com nine brands.